Recent work travel has taken me to several conferences at the Gaylord resort at National Harbor in Maryland. Considering that the DC area generally has rather good transportation, National Harbor is notable in that it doesn’t; it’s mainly it’s own little isolated enclave with a large resort, a casino, and a handful of touristy restaurants (although among the various tourist joints are a few serviceable places like Nando’s and the quite good Succotash). And while I do love some Nando’s, I was really in the mood for something more like Peruvian chicken. 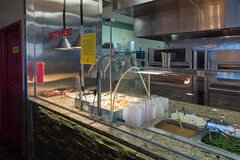 As you may remember from my reviews of Super Pollo or El Pollo Rico, I rather enjoy a good, fresh, Peruvian-style pollo, and the DC area does have a lot of options. So, on a recent trip to National Harbor, I called up my friends Jen and Tom, and they came and took me to Oxon Hill (just barely beyond what I’d call a “long walk” from the Casino to a fairly new joint in Oxon Park called El Rancho. Like a lot of Peruvian chicken places, El Rancho is fairly plain from the outside (and indeed, if I didn’t know better, the artwork and name would have led me to suspect a cheap Mexican place). 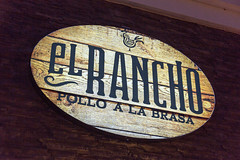 But once you are inside, El Rancho looks a lot like most Peruvian pollo a la brasa places: A large rotisserie of birds cooking over charcoal, a serving line where chicken is sliced up and served up with plantains or yucca, and a selection of side dishes, all done up cafeteria style. Indeed, that’s basically what you come here for: pollo a la brasa, although they’ve got a good selection of other dishes as well: for those wanting a little more cowbell for their chicken, you can get arroz con pollo. For those wanting steak, they’ve got lomo saltado, a Peruvian-style steak stir fry, or they’ve got several skewered meats available as well. In other words, if you are looking for some good grilled or wok-seared Peruvian food, they’ve got you covered. 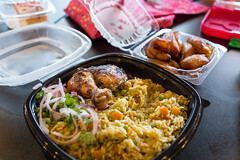 I’d been craving a good arroz con pollo, so that’s what I ordered, along with a side of plantains. I’ll have to say, I was quite satisfied: the arroz itself was a rich, plentiful, and flavorful mound of cilantro rice with onions, with just a little bit of the paella-style crunch from the rice resting against the pan. Adding in a half a roasted chicken, this was a good combination: the chicken was nicely crisped, very juicy, and very flavorful with a nice yellow-pepper tang to it. It was, however, almost too generous: my side of plantains, which were also very nicely fried just to the point of caramelization, were delicious enough, but lacking stomach space, most ended up going to the refrigerator in my hotel room. Showing that El Rancho was not a single-trick pony, my friends Jen and Tom opted for the lomo saltado, and that was also a surprisingly good dish: very tender strips of flavorful, seared steak served up in a generous portion with black pepper, garlic, hot peppers, and onions served up over rice, this was also a great dish, indeed, if I end up returning soon I’ll have to give that dish a try. Overall, El Rancho was everything I expect from a Peruvian place: excellent roasted chicken, with good plantains, good rice, and a selection of sides. Add in generous portions and a more diverse menu than many of its competitors, and it’s one of the greater National Harbor area’s better dining options. Whoa! We made the blog!! It was a thoroughly enjoyable meal with excellent company!! Thanks for the opportunity to travel outside our box!